Bottom Dumps | MATE, Inc. Commonly used for road work (windrowwing) or applications requiring dumping into a hopper. In operation, this trailer is completely unique from the end dumps. 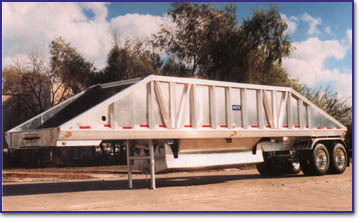 The bottom dump unloads from a clamshell gate underneath the trailer, and does not require a hoist or "wet kit" to operate. Any truck designed to pull a semitrailer can tow this model as it requires only "truck air" for operation. Commonly used for road work (windrowwing) or applications requiring dumping into a hopper. Truss Construction Top rail and main frame rails are aluminum alloy 6061-T6 structural with 25 ton rating on highway use. Overall width 95.5". Hopper .150" Aluminum alloy 5454-H32 sides. 0.156" bulkhead with reinforced corners. Lower bin 0.250" aluminum alloy 5454-H35 plate with edging. Capacity 25-40 Cubic Yards. Bang boards. (10" or 12" Pockets) optional. Kingpin S.A.E. alloy steel mounted in a fixed upper fifth wheel plate. (rocking upper coupler optional). Gate Single Clamshell gate with hopper opening 60" x 131.5. (I.D.) lengthwise windrow. Cylinder: two 8" diameter chrome plated rods with quick release valves. reservoir capacity 13,860 cubic inches. Air line lubricator for gate system. Controls: Electric over manual air operated gate control. Suspension Four Spring: Hutch H-9700; 50,000lb capacity. Air Ride: Hendrickson Intraax; 50,000lb capacity. Hub & Drum Four Spring: ArvinMeritor TQ-4670-LH with 5/8" wall; 25,000lb capacity. Air Ride: Hendrickson Intraax Axle & Beam Assembly. Brake System ArvinMeritor WABCO anti-lock brake system (ABS). Wheels Steel disc 8.25 x 24.5 tubeless, painted white. Legal Equipment Aluminum fenders rubber mounted over rear axles; rear end mud flaps. Lights and reflectors in accordance with federal motor vehicle safety standard number 108. Weight 9,700 lbs. on super singles and aluminum wheels. In operation, this trailer is completely unique from the end dumps.